Donald Trump’s supporters are passionate, but there aren’t that many of them. Despite what you may have read elsewhere — or heard from the man himself — Donald Trump is not all that popular with Republican voters. Sure, he’s in first place in many polls. But Trump is near the back of the pack by another important measure. On average in these polls, Trump’s favorability ratings among Republicans are barely better than break-even: 47 percent favorable and 43 percent unfavorable. 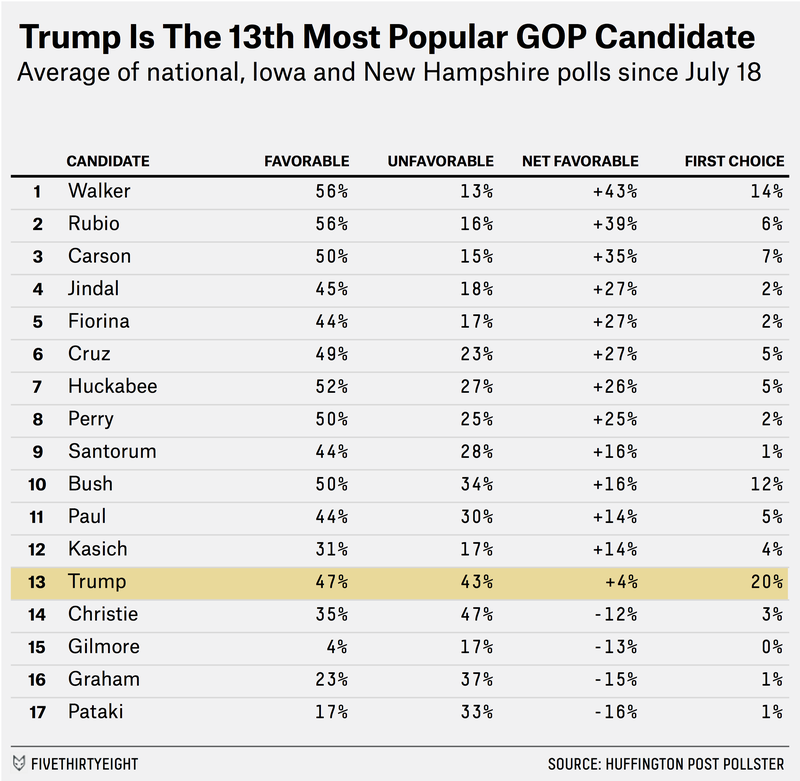 Among the 17 Republican candidates, Trump’s net favorable rating, +4, ranks 13th, ahead of only Chris Christie, Jim Gilmore, Lindsey Graham and George Pataki. And yet, in these same polls, Trump is the first choice of an average of 20 percent of Republican voters — the highest in the field, ahead of Scott Walker (14 percent) and Jeb Bush (12 percent). What’s going on? On Twitter yesterday, I likened Trump to the band Nickelback: disliked by most people but with a few very passionate admirers. The best contrast to Trump is Marco Rubio: like a “lite rock” radio station, he’s broadly acceptable but few people’s favorite. Rubio’s favorable ratings are much higher (56 percent) than The Donald’s, and his unfavorable ratings are much lower (16 percent). But only 6 percent of Republicans list Rubio as their first choice. The Nickelback analogy isn’t perfect. As the Republican strategist Patrick Ruffini points out, the bulk of Trump’s support in polls isn’t necessarily coming from passionate Republicans but rather from “low-information voters” who may not turn out in Iowa and New Hampshire. That doesn’t mean none of Trump’s support is real, however. There’s another factor that helps him: He’s highly differentiated from the rest of the Republican pack. Real Clear Politics’ David Byler, analyzing the text of Republican candidate announcement speeches, found that Trump was bringing up far different concepts and issues than any other Republican, including his personal wealth, business success and ability to negotiate deals. 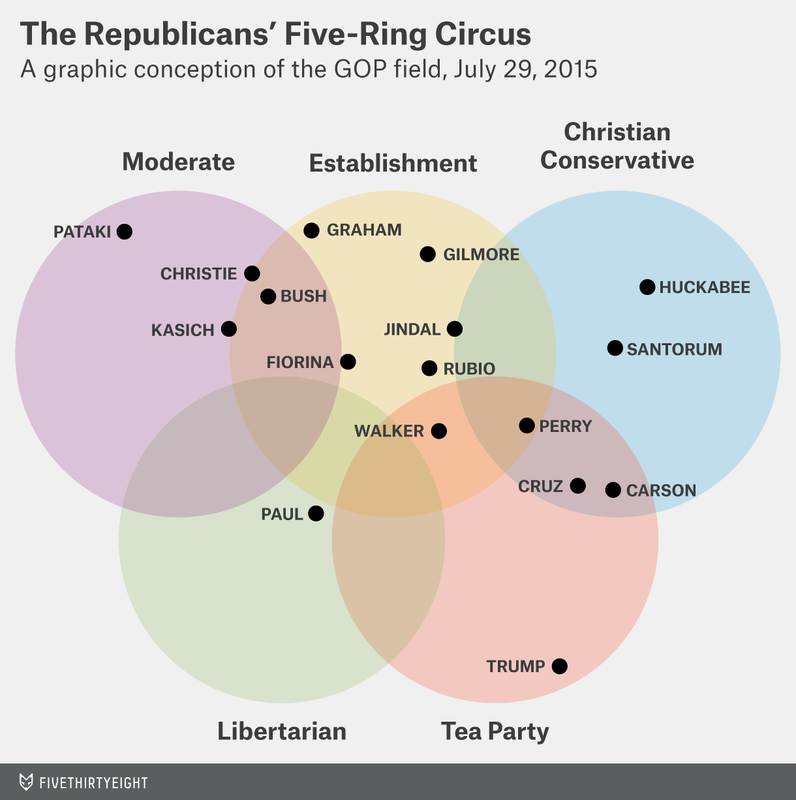 FiveThirtyEight’s own, more subjective way of analyzing the Republican candidates — what we call the “five-ring circus” — comes to a similar conclusion. Given the ever-changing grab-bag of issues that he’s campaigning upon, Trump is hard to classify, but his stylistic flourishes (if not his background) probably place him closest to the tea party or populist wing of the Republican Party. Either way, there’s no one else quite like him. Rubio, by contrast, has lots of competition. He’s well-liked by voters across different constituencies of the Republican Party. That’s potentially a good position, since the nomination race has historically been a consensus-building process. But he isn’t necessarily anyone’s first choice. Voters who are just slightly to Rubio’s left may prefer Jeb Bush, while those just slightly to his right may prefer Scott Walker. It could work out for Rubio, but he also runs the risk of being this election’s version of Tim Pawlenty, a candidate whose resources dry up because he fails to differentiate himself from the pack early enough. I’ve seen a lot written about how these primaries are unlike anything we’ve seen before. What’s undeniably different is that Republicans have an unprecedentedly broad and deep group of candidates. That means it might take longer to winnow down the field to one or two establishment-backed choices. It isn’t so unusual, however, to see a candidate like Trump polling at 20 percent. That happened for several Republican candidates in 2012, including Newt Gingrich, Michele Bachmann and Herman Cain. While their support mostly faded before the first states voted,2 there have been other occasions when factional candidates such as Pat Buchanan, Pat Robertson or Ron Paul held on to their support through Iowa and New Hampshire. I don’t mean to suggest that favorability ratings are foolproof. Like the first-choice numbers, they can fluctuate. Before Trump officially declared for the presidency last month, his favorability ratings among Republicans were execrable. They improved after he announced his candidacy but have since slipped back to mediocre (well below the standard of candidates who have won their party’s nomination in the past). I know it’s slightly unorthodox to mix state and national polls, but since favorability ratings can vary a lot from poll to poll, I think it’s worth it to combine them in this case to get a larger sample. I included all national, Iowa or New Hampshire polls after Trump’s McCain comments that tested favorability ratings among Republican voters. Although Gingrich had a brief resurgence later in the race. Five of the seven polls I mentioned before — the exceptions are the Marist College polls in Iowa and New Hampshire — asked Republicans for their second-choice preference. Trump was listed as the second choice by just 9 percent of voters in these polls, on average.